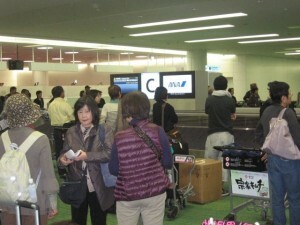 Haneda Airport's baggage claim area. It appears the industry overestimated Haneda’s appeal to travelers, and it also might have miscalculated how many passengers remain in Tokyo, as opposed to those who connect to other destinations. It’s true that the March earthquake and tsunami had a negative impact on travel to Japan in general, but traffic to and from the much bigger Narita Airport has largely recovered. Haneda’s smaller size and proximity to central Tokyo provide a significant advantage. However, as I first wrote two years ago, most medium- and long-haul flights arrive and depart between 10 p.m. and 7 a.m. — not exactly the most preferred time by the majority of travelers. In addition, onward flight connections from Haneda are extremely limited. That didn’t seem to bother most airlines last year, when the rights to fly from various foreign cities to Haneda were being awarded by the Japanese and other governments. U.S. carriers in particular made rather bold proposals. In the end, the Department of Transportation gave American Airlines the right to fly from New York, Delta from Detroit and Los Angeles, and Hawaiian Airlines from Honolulu. American’s flights are nowhere to be found in its winder schedule, though they are planned for next summer. The same goes for Delta’s Detroit flights. It does operate the LA flight throughout the year, as does Hawaiian on the Honolulu route. Air Canada has postponed indefinitely its plan for flights from Vancouver, even though it started selling tickets late last year. The Japanese carriers have trimmed their plans, too. All Nippon Airways has kept only LA in North America, while Japan Airlines serves San Francisco. European and other long-haul routes are also very few. British Airways is the only foreign carrier outside Asia and the United States that currently flies to Haneda — and not every day. The Asian carriers include Air China, Asiana, Cathay Pacific, China Airlines, AirAsia, China Eastern, Eva Airways, Korean Air, Malaysia Airlines, Shanghai Airlines, Singapore Airlines and Thai Airways. Flights loads to and from Haneda are not what those carriers expected — my Singapore Airlines flight was less than half-full in Economy and about two-thirds full in Business Class, where I had two lie-flat seats to myself, though even one would have been just fine. This entry was posted in Travel and tagged Air Canada, Air China, AirAsia, airport, All Nippon Airways, American Airlines, Asiana, Cathay Pacific, China Airlines, China Eastern, Delta Airlines, Department of Transportation, DOT, Eva Airways, Haneda, Hawaiian Airlines, Japan, Japan Airlines, Korean Air, lie-flat seats, Malaysia Airlines, Shanghai Airlines, Singapore Airlines, Thai Airways, Tokyo. Bookmark the permalink.